Can a diplomat who fasts on Earth Day deal with hard-liners at the bargaining table? For Naderev "Yeb" Saño, fasting for climate change has become a way of life. The once-anonymous diplomat from the Philippines rose to fame in environmental circles last year when, saddened by the devastation of Typhoon Haiyan and frustrated by the slow pace of international action, he fasted through two weeks of U.N. climate change treaty talks. These days, the Philippines' lead negotiator continues to avoid food and drink on the first day of each month, as part of what he has called a personal spiritual journey. ClimateWire: Last year at the [Conference of the Parties to the U.N. Framework Convention on Climate Change] in Warsaw, Poland, you fasted throughout the two-week negotiations as part of a call to action. Hundreds of people fasted with you, both at the negotiations and around the world. How has life changed for you since? Yeb Saño: The past five months have been really overwhelming for me. I've done a lot of university tours. I've given talks, in some cases for thousands of students and teachers at one time. 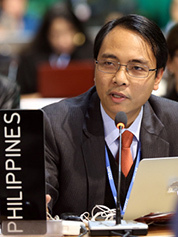 Yeb Saño, the Philippines' climate negotiator. Photo courtesy of adoptanegotiator.org. My family lives a very simple life. I come from very humble beginnings, and we still do live that simple life. I still take public transport most of the time, despite public transport being a challenge here in Manila. But one of the things that has really changed is, I have been thrust in a position of responsibility to be a voice for the inarticulate. A lot of people look to me to continue expressing their voices. The past five months have been deeply touching to see so many people. You don't know how surreal it is for me. I have never been in a situation where I walk on the street and people recognize me. I enter a Starbucks, and the crew would recognize me. People would approach, and the most touching thing is that people would approach me and they say, "Thank you." CW: Typhoon Haiyan, which hit in November just weeks before the climate negotiations, struck down in your father's hometown of Tacloban and destroyed many of the provinces in the central part of the country. How is the recovery progressing? Saño: I have been to my father's hometown. There's a lot to be done yet. It's still a big undertaking, and it will take some time before we can truly say that the communities have really picked up the pieces and gotten back on their feet. A lot of things are yet to be accomplished. The Philippines is not a stranger to disaster, but Haiyan was unprecedented in many ways. We learned a lot of lessons from that. A lot of people have asked me whether Tacloban or the Philippines is ready for another supertyphoon. If "ready" means no lives lost, I think it would be dangerous to presume that we are ready to prevent lives being lost. If by ready we mean no damage or losses, the answer is clearly "no." But if by ready we mean communities are more aware of the dangers and the national government is mindful of not just the disaster risk but the implications of climate change, then I think we have learned a lot of lessons and we can say that we have taken the necessary steps to not just prevent the kind of magnitude of damage we experienced but the kind of response that we would implement. It's amazing how a society can get together to address the many issues that we face. Obviously, though, we could not address all issues 100 percent, because many issues, including climate change, is outside of our hands. CW: What were you doing before you became the lead climate change negotiator for the Philippines? Saño: I worked with [the World Wildlife Fund] for 14 years. I established the WWF Philippines climate program back in 1997, even before everyone started talking about climate change. My first project was to assess the impacts of climate change on coral reef ecosystems and fisheries. I have a degree in philosophy and a graduate degree in community development. The philosophy degree has been very helpful, because I have been trained to see and to appreciate whether something being said is logical or not, and much of what we deal with in the climate negotiations has a lot to do with ethics ... including environmental ethics. All of that comes into play. CW: Speaking of philosophy, the latest [Intergovernmental Panel on Climate Change assessment] takes a stab at the ethical issues surrounding dividing up the burden for addressing climate change. Ultimately, though, the IPCC doesn't provide any answers -- and the issue is also one that continues to stymie countries in the U.N. negotiations. Countries have agreed to design a new deal that is "applicable to all, under the convention," but with less than two years to go before deadline, it's still not clear what that will mean in practice. How do you see this working out? Saño: What we have been seeing is the predictable stands of parties to protect their national interest. Talking about ethics, talking about equity, we do need to be guided by what we have agreed upon in the framework convention [that countries signed in 1992 launching the U.N. climate regime]. It spells out certain principles, historical responsibility and equity for many countries that has been operationalized through the annexes. How the annexes come into play in the negotiations is very contentious. CW: The annexes were created in 1992 and divide countries into two groups -- Annex I, or wealthy industrialized nations currently on the hook for reducing emissions, and non-Annex I developing nations asked to make voluntary cuts in exchange for finance. The United States and other developed nations call this system outdated, given both the skyrocketing emissions and rising wealth of many emerging economies. Where does the Philippines stand? Saño: I think the annexes must remain as they are in the context of the spirit of the convention. It captured historical responsibility, and it captured the principle that much of the emissions in the atmosphere when the convention was adopted primarily came from countries listed in Annex I. This is a problem when countries do not recognize historic responsibility. CW: According to the latest IPCC report, about half of cumulative emissions between 1750 and 2010 occurred in the last 40 years. Much of that was from China. Doesn't that beg the question -- how much longer will emerging economies be able to use the historic responsibility argument to avoid taking legal obligations, as well? Saño: Yes, as time goes by, everyone's historic responsibility will increase. Yes, some emerging economies have been growing faster than we've expected. The problem with the optic there is, these countries have done even more than Annex I countries. We've seen the China story change drastically in the last decade, and then shift again. Recently, they've made some really significant pronouncements where the use of coal is concerned. So it becomes a lot more difficult to keep on pointing the finger at emerging economies when they are also emerging as doing a lot more. We feel that every ton of carbon dioxide that is emitted into the atmosphere has a corresponding responsibility from where it is emitted from. How do we distribute that? That is the challenge. The Philippines' point of view is that every country can participate in this regime. I think the key is not to distribute responsibility according to merely the level of emissions per country, but there has to be a certain consideration of the level of welfare of the citizens of each country. It's a critical balancing act. Countries like Saudi Arabia and even China will always have the right to invoke the climate convention. [But] speaking from the point of survival, I think we have reached a point where Annex I countries alone can't solve climate change. That is a fact. We have gone way past that point where rich countries can solve climate change alone. The solution will have to lie in global solidarity, and each country that can contribute must contribute. CW: And yet Saudi Arabia, with which the Philippines aligns itself in the U.N. talks, has maintained that the contribution of non-Annex I countries in any new agreement should be only to adapt to climate change, while Annex I countries should continue to be the ones to take legal responsibility for cutting emissions. So which is it? Saño: We cannot force countries which are not Annex I countries to take on obligations of the same nature as Annex I countries. However, I think countries must set aside narrow national interests and be able to contribute in an ambitious way, not just towards a post-2020 regime but an immediate regime. My country cannot afford to wait six more years for the whole world to take action, and six years of no legally binding emissions cuts for me is a catastrophe. This is a global endeavor, and if we are to subscribe to narrow national interests, we can go our separate ways and forget about solving climate change. What the Philippines, I think, would like to advocate for is a Greenhouse Development Rights approach. I know that's not going to resonate well with many countries, both in the north and in the south, but it's really about rights. It's about the life of a single Filipino having the same value as one American or one European. We all deserve equitable access to the planet. That should be the primary parameter, rather than economic competitiveness. CW: The Philippines has put 500 million [Philippine pesos, or $11.1 million] of its own money into a People's Survival Fund to help local communities build resilience to climate change. Your country is also investing in geothermal and other renewable energy. If the country is acting progressively on so many different fronts, why does the Philippines align itself in the U.N. climate talks with the Like Minded Group, a bloc that includes major oil exporters and is often accused of blocking progress? Saño: What is the Philippines like-minded about with Saudi Arabia, China, ALBA [the Bolivarian Alliance for the Americas nations, including Nicaragua and Venezuela], Malaysia, India? There are a lot of things, including being able to contextualize this whole discussion through the principles of the framework convention. This is something we care deeply about. For me, that is the common ground with these countries -- because the framework convention is something that is agreed and is right now the only thing we have. There is a risk that it will be renegotiated, and there is even a risk it will be set aside altogether, and we will not be able to solve climate change if we set aside the framework convention that we established in 1992. It's still very relevant, and we think it should be protected. If it is set aside, we have nothing, and what we will have is a hugely disproportionate or biased agreement. It will be something that will prejudice the interests of the most vulnerable nations on Earth because the convention is something we have not even fully implemented. The key here is that countries that have the capacity, and most of those countries are in Annex I, have not even met their targets and have not even been able to fulfill obligations under the commitments. Whatever regime evolves out of this [in 2015], and what we are pushing for is a regime that involves everyone, doesn't have to contradict with the differentiated commitments set out in the convention. There is also the issue of national interest. You also have to realize that more than 10 million Filipinos live abroad, and most of them live in countries that depend on the economies of oil-producing countries. That is something that is a very real concern. Until we are ready to bring our folks back home, we do have a stake in this very complex issue of how we respond to climate change, the measures that we take to respond to climate change. That is a very real concern for us, not just in a diplomatic sense but for the welfare of the very Filipinos who work abroad. CW: Will the new agreement negotiators hope to reach in 2015 replace the 1997 Kyoto Protocol? Saño: Replace is a rather inaccurate word. Technically, the Kyoto Protocol does not die until it has been repealed or it has been rendered dead by the parties. However, its provisions become meaningless when countries that are supposed to have commitments walk away from it, and a big number of countries have walked away from it. But then we still have Kyoto until 2020. There is where it becomes tricky. For many developing countries, especially the large emerging economies, and to a certain extent that includes the Philippines, if we don't see commitments under Kyoto being taken seriously ... that would be a big blow to the process in Paris, because that doesn't build trust, and that is for me one of the problems right now. CW: What if anything makes you optimistic about the 2015 process? Saño: I am heartened that the U.S. and China are working very seriously on climate change. For me, what China and the U.S. are doing right now is unprecedented. If they follow through with concrete action ... I think we can make things happen. There's a big chance that by the time we get to Paris, we can have that ambitious agreement, something that is durable. It might sound like a cliché, but I don't think there is room for being pessimistic about this process. Maybe it's the fasting talking, but I kind of look at people and my negotiating partners in a more sensitive way, that they are also people. It's a case where I have to just believe in humanity. CW: What do you hope to hear from Obama in the Philippines this week? Saño: I can't imagine anything more that he needs to say that can change the texture of the climate negotiations. You know how enamored we are with President Obama. For me, the mere mention of climate change from his mouth is something that we would truly appreciate. If he articulates the climate problem in the context of this visit, that would be big for me. I'd really be the happiest person on Earth if I heard him reiterate the science and reinforce the message to keep the conversation moving forward.